This Buffalo Chicken and Broccoli Bowl is fast, easy and flavorful. 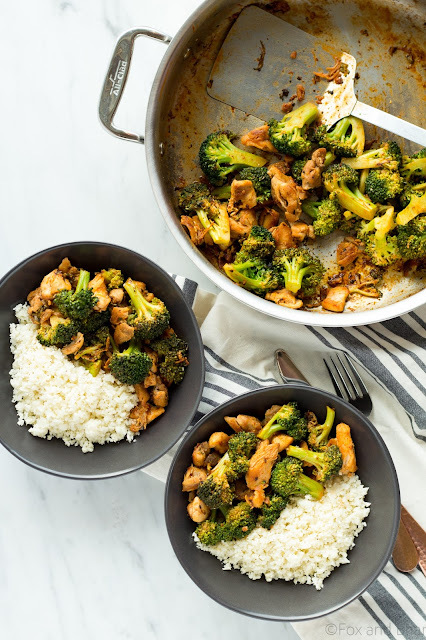 Chicken and broccoli in a buffalo sauce, served over cauliflower rice makes a gluten-free, low carb, high protein, paleo and whole 30 friendly meal! 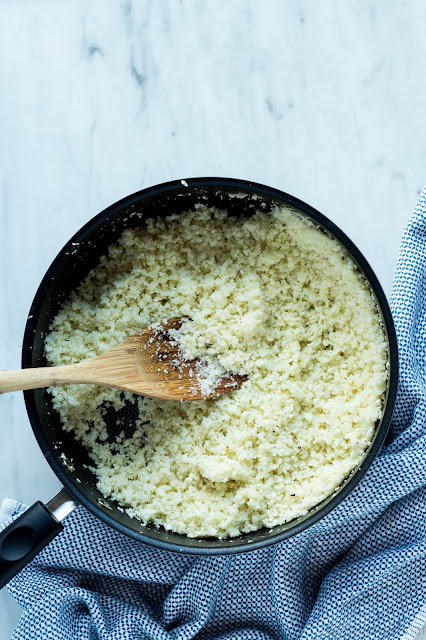 A few tricks I learned that make the cauliflower rice turn out a little better. When cutting the cauliflower into florets, be sure to cut them into uniform pieces and remove any large chunks of the stem, as it does not break down as well. I use my food processor to break down the florets into “rice”. It works better if you do it in two batches, because if the food processor bowl is too full it will not break them down as evenly and you will get some really big chunks and some parts that are pulverized into mush. If it is overprocessed you will have something more like cauliflower mash, which is not terrible, but it doesn’t have the consistency of rice. I found that working in two batches and pulsing my food processor about 20 times gave me the texture I was looking for. Basically, you want the pieces to be about the same size as rice. This Buffalo Chicken and Broccoli Bowl is fast, easy and flavorful. Chicken and broccoli in a buffalo sauce, served over cauliflower rice makes a gluten free, low carb, high protein, paleo and whole 30 friendly meal! Cut cauliflower into medium to small sized florets, removing the green leaves and any tough stem. Working in batches, place florets into the food processor and don't fill the bowl more than halfway. Pulse until the cauliflower resembles grains of rice, about 20 pulses. Try not to over process or you will have cauliflower mash! Heat a skillet or saute pan over medium heat with olive oil. Add cauliflower and season with salt and pepper. Saute until tender 5-8 minutes. Heat a skillet or saute pan that has a lid over medium high heat. Add oil if using, and when hot add chicken. Season with just a little salt. allow to cook on one side until browned, then turn and brown the other side. Cook until no longer pink, 4-5 minutes per side. When chicken is cooked, add broccoli to the pan and cover. Allow to steam until tender 5-10 minutes. You can give the pan a stir a few times if you want to keep the chicken from browning too much. Broccoli is done when easily pierced with a knife and still bright green. Meanwhile, prepare the buffalo sauce. Melt 2 tablespoons of butter with the hot sauce and whisk to combine. Pour the sauce over the chicken and broccoli, toss to coat everything in the sauce.